I was lost in my thoughts, appreciating the beautiful view of Boracay from the swimming pool area of Villa Caipirinha, mentally giving myself a high-five for scoring a fantastic opportunity to stay in such a luxurious accommodation when I heard someone say that we wouldn’t be staying there for the night. “What? We’re not staying here? !” I asked in disbelief, already concocting plans of feigning an illness so I wouldn’t be forced to go. “Why the hell not?” I asked, threatening to throw a tantrum. “Ooh Azalea,” I replied, immediately feeling appeased. We alighted from the van and saw this big globe installation. Apparently, this is Azalea’s trademark because the Baguio has its own globe too. 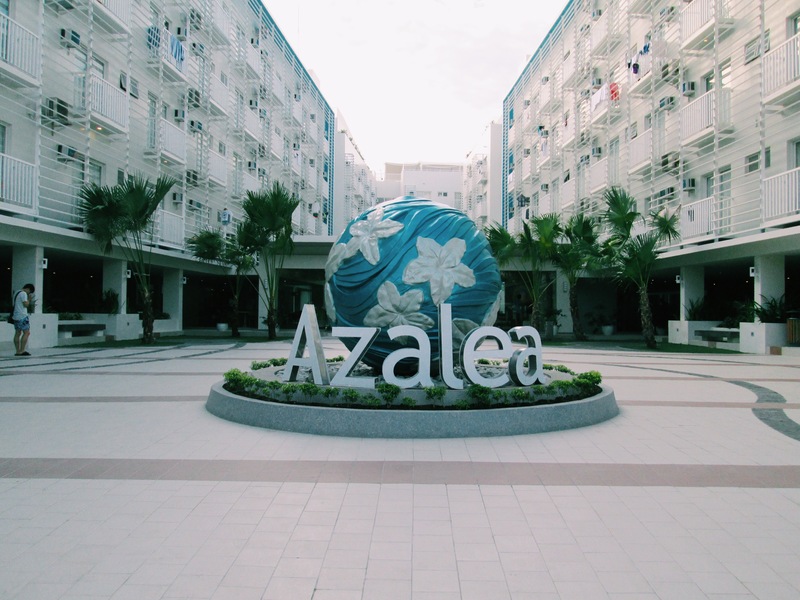 I immediately noticed its difference with the Baguio hotel, Azalea Boracay takes a more modern architecture and design. The colors are also kept light, a play of blues, greens, whites, and browns to suit the island vibe. When we entered the lobby, we were greeted with the receptionists behind tall tables that were set separately they looked like they were contestants on a TV show. I found that amusing. They were all smiling and they welcomed us so warmly I was almost suspicious (kidding, lol). Our friends from the Travelbook.ph gave us our room assignments. I was billeted in the same unit as Cai (Travelosyo). As soon as we entered the room, Cai started shouting for joy; I meant he literally screamed in excitement. He entered his bedroom and he squealed, he entered my room and he squealed, he entered each bathroom and he squealed. He did so much squealing I half-feared someone would suddenly come in to see if a pig is being butchered. He later explained that he has a fascination with hotels and that he screams in delight everytime he enters one. I was like, okay. 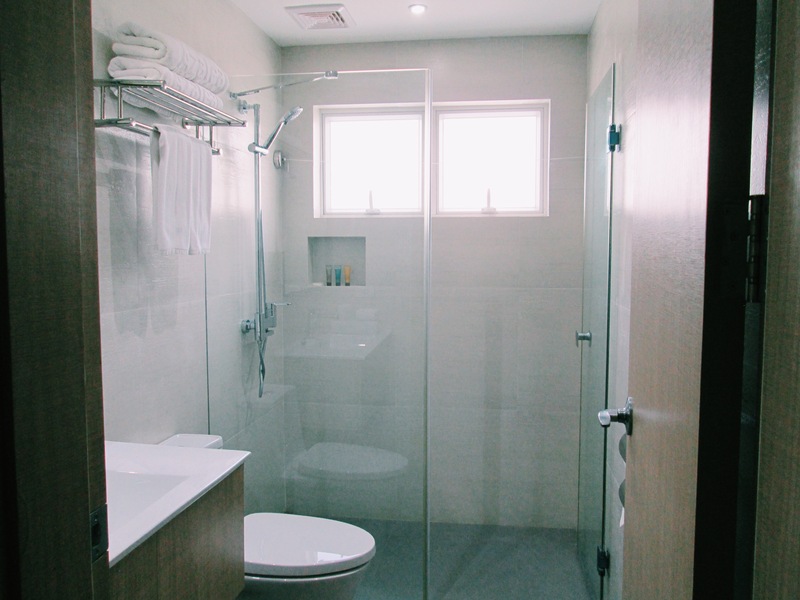 So there are two bedrooms and two showers with toilets. 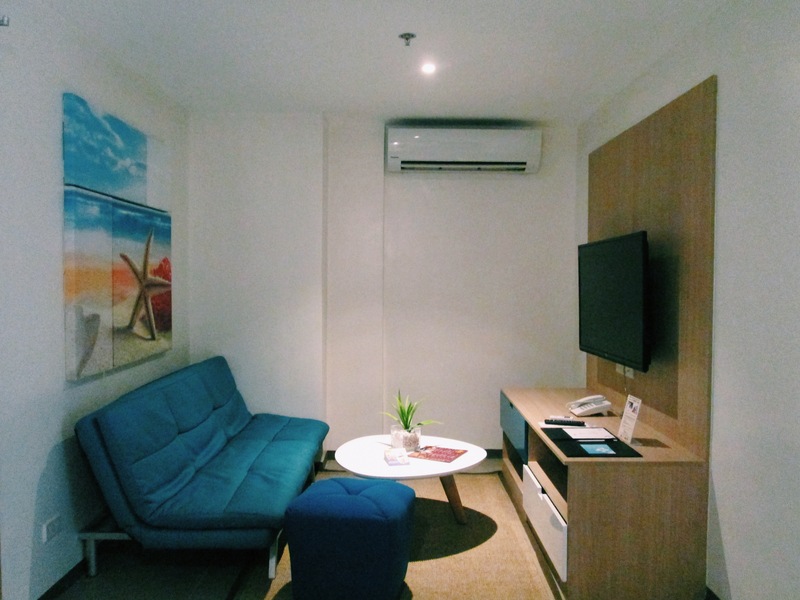 The room is equipped with a kitchen and a dining table, there’s also a small living room with a huge flat-screen TV. There is free WiFi connection, but sometimes the signal was weak. 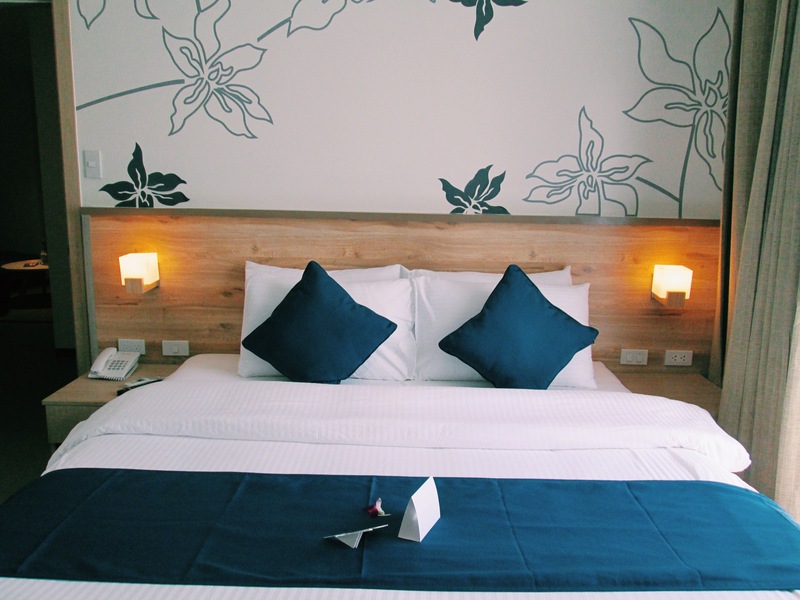 Now let’s go to the bed, the bed is very spacious, even better than the one that I had in Baguio that I started a new affair hehehe… I loved sleeping there, it was so comfortable, I’d just about forgotten my disappointment for not staying at Villa Caipirinha that night. 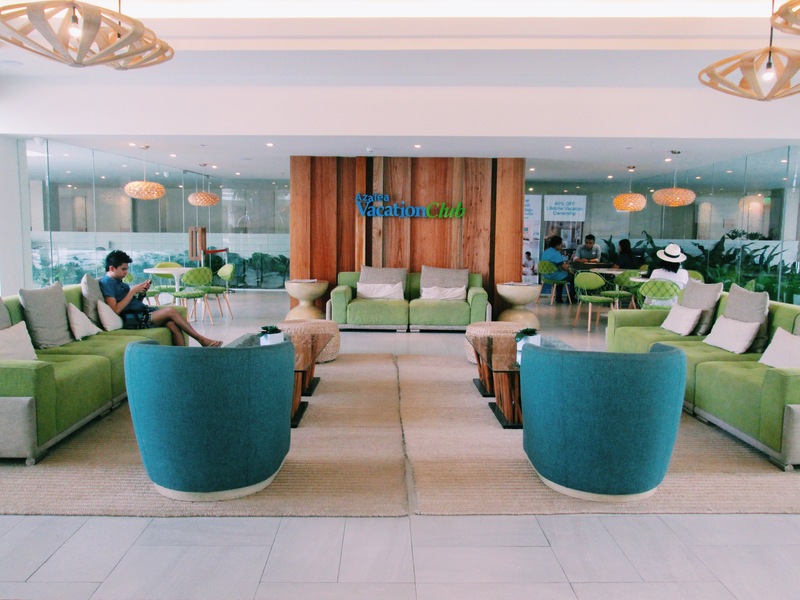 I admit our stay there was sponsored, but I am not over-hyping things, I really loved our stay at Azalea Boracay and if you are after a comfortable accommodation during your time on the island, I suggest you book your stay there. You’d probably squeal in delight too. This looks like a great alternative to the beachfront properties of Boracay. 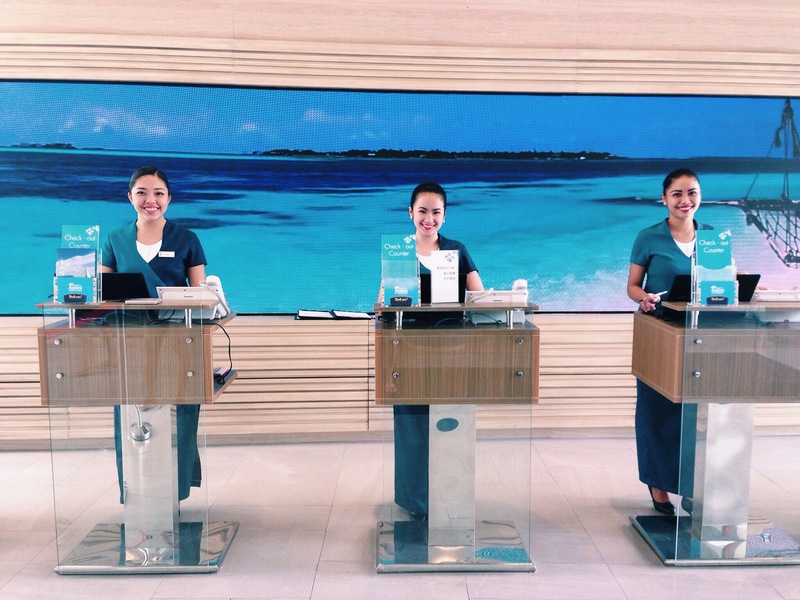 I must admit I too thought the front desk staff looked like they were participating in a game show. But, they all look very friendly. Thanks for sharing this lovely option for a Boracay stay. Awesome place too stay! Planning on going to Boracay soon and this hotel sounds and looks perfect! I do remember your post on Azalea in Baguio so I did a double take when I first saw this post. Interesting to know that Azalea is present in Boracay too. These two are places I have never ever been to. The bed does look really comfy. Haha, I can just imagine the squealing. Such a fun company to be around. Haahhhahahhahah, he is a squealer. Great thing that he didn’t squeal out of fear of disgust! This is a lovely hotel, looks modern and aesthetically designed. And yes the reception is so different, it actually looks like the sets of a TV show ! Well the place looks really beautiful and I might consider this place in our Boracay trip on October. Thanks for sharing and for the photos. I’ve never heard of Azalea but this sounds like a perfect spot if you’re traveling with friends! I always like to have a little peace and quiet time after discovering a ton of new things, so it really looks like one would be able to find sweet repose in between discoveries! They totally look like contestants on a TV show though…you’re right! I didn’t know Azalea also has a branch in Boracay! All I ever know is the one in Baguio. It ‘s really great finding out that some of your favorite hotels are also in other places. It guarantees a great experience.